There’s a better way to use your time on Facebook today. Go to Friendly Planet Travel’s Facebook page, where one click enters you to win a trip of a lifetime for two to South Africa. Just by becoming a fan of the page, you could win a seat on Friendly Planet Travel’s 13-day Best of South Africa tour for yourself and a friend, a prize valued at over $8,500. In addition, for every one of your friends who enters the giveaway, your name will be added to the pool again, increasing your chances of winning. Not only that, but Friendly Planet Travel is taking things a step further and ringing in 2012 by giving away five more exotic trips throughout the year with its “Win the World” sweepstakes. Each will include flights, great hotels, some meals, and plenty of escorted touring. — Amazing Peru: Visit Lima, the country’s capital; Cuzco, the 11,000-foot-high Inca capital; Machu Picchu, the Lost City of the Incas and one of the most impressive archeological discoveries of all time; and Lake Titicaca, among the highest and most beautiful lakes in the world. — A Taste of China: Visit China’s three most important cities: Beijing, the thriving and modern capital of China; Xi’an, where the Terra Cotta Army, one of the most significant archeological finds ever is found; and Shanghai, often called the Paris of the Orient and the heart of business in China. — Best of Turkey: The crossroads of Europe and Asia, Turkey is an exotic land steeped in history and touched by many civilizations. Visit Kusadasi on Turkey’s Aegean coast, a crossroads of art and culture since it was founded 5,000 years ago. There’s also Ephesus, one of the Seven Wonders of the Ancient World; Troy; Canakkale; and Istanbul, a magnificent city on the Bosphorus. — A Taste of Ireland: Visit Dublin, Ireland’s capital and its most populous city. Also see the Ring of Kerry; Muckross House, one of the most sumptuous residences of Ireland; the Cliffs of Moher, the most majestic cliffs in Ireland; Medieval Kilkenny; and more. — Taj Mahal Express: Visit fascinating and exotic Delhi; Agra; and the Taj Mahal, the world’s most famous and lovely monument to love. There’s also Jaipur, called the pink city because of its lavish mansions and palaces. The “Win the World” sweepstakes is open to all legal U.S. residents over the age of 21, beginning Jan. 3, 2012 at 12 p.m. EST and ending March 31, 2012 at 11:59 p.m. EDT. To enter to win, visit Facebook.com/FriendlyPlanetTravel, become a fan of the page, and enter the required information. There is no purchase necessary to enter the sweepstakes, and the winner will be announced on our Facebook page, the Friendly Planet Travel website, and the Friendly Planet Travel blog. The first of six prizes in the sweepstakes is an unbelievable tour for two to the warm, welcoming country of South Africa, where the winners will soon see why it has become one of the most spectacular vacation destinations in the world. The prize has all the inclusions travelers expect from Friendly Planet Travel, including round-trip airfare from New York’s JFK airport on South African Airways (including fuel surcharges), and ground transportation and transfers within South Africa. It also includes 10 nights in superior and first-class hotels; 16 meals; a professional, English-speaking tour director; a comprehensive touring program; safaris (including entrance fees); and the special opportunity to spend some time with elephants at Elephants Whispers. Travelers will begin their South African adventure in South Africa’s largest and most populous city, Johannesburg, known as the “City of Gold.” Then the journey continues with a scenic drive to the Mpumalanga Province, passing through Lydenberg; Pilgrim’s Rest, a quaint historical mining town from centuries ago; and Graskop, near the Blyde River Canyon. Travelers will even stay in a lodge located on the Karongwe Private Game Reserve in the heart of Limpopo Province. They’ll get to ride in an open safari vehicle for a game drive into the untouched African bush in search of the Big Five–lions, leopards, elephants, rhinos, and buffaloes. And then they’ll explore on foot during a bush walk with a ranger who will teach travelers about animal tracking and bird and plant identification. The South African adventure doesn’t stop there, with early morning game drives and a trip to Elephant Whispers, where travelers will have an up-close interaction with the magnificent creatures. Cape Town and Cape Point will be explored with their white beaches and a visit to mighty Table Mountain, Cape Town’s most striking landmark. Included in the tour is a full-day excursion to Cape Point, with a cruise along Hout Bay View. And travelers will have lots of leisure time to explore on their own between each activity. To enter to win and for continual updates about the giveaways, check out Friendly Planet Travel’s Facebook page. For more information, visit http://www.friendlyplanet.com, Twitter or blog. As holiday shopping time enters high season, there is a chance for a big Christmas gift for Japan fans. Starting November 30, Japan National Tourism Organization (JNTO) runs a month-long sweepstakes campaign for the US market on Facebook with the grand prize of a customized trip for 4 to Japan. 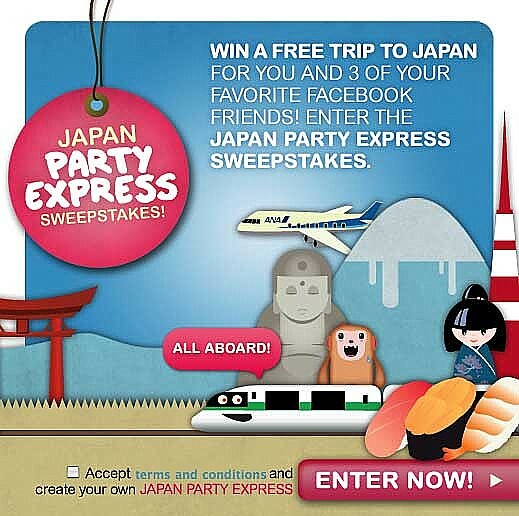 From November 30 through December 30, the campaign is open to participants to enter the Japan Party Express sweepstakes on JNTO’s Visit Japan Facebook page. Each participant must enter with 3 other Facebook users who are also friends of Visit Japan’s page. Friends of JNTO’s Visit Japan can access to the sweepstakes at the Visit Japan Facebook page. The prize goes to one entry, a group of 4 lucky Facebook friends, who will travel to Japan with a theme chosen from 4 categories; food, tradition, adventure and pop culture. The winners will travel between January and the end of March, 2012. The Japan Party Express Sweepstakes is part of an ongoing effort to raise more public awareness of the Visit Japan Facebook page among digital social network communities. The Executive Director of the JNTO New York Office, Ms. Yuki Tanaka, hopes to have more people becoming friends of Visit Japan page on Facebook as well as increase the presence of tourism to Japan in the digital world. This campaign is exclusively for the U.S. market, and the entry eligibility requires Facebook users to be friends for Visit Japan page residing in the United States. Visit Japan’s US Facebook page currently has more than 70,000 friends, and provides daily updates on tourism to Japan, deals, Japan travel related news and Japan related topics.